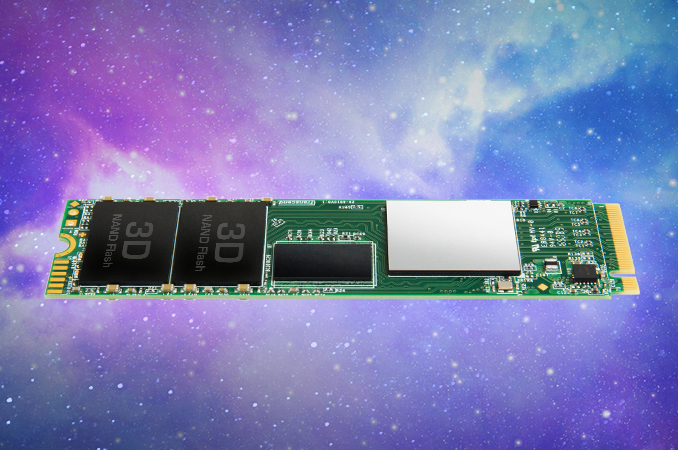 Transcend has announced its first SSDs based on 3D MLC NAND flash memory. The MTE850-series drives are aimed at the higher-end of the market and promise up to 2.5 GB/s sequential read speed along with endurance-related advantages of 3D NAND. Transcend does not disclose exact specifications of all its new MTE850 series SSDs, but only shows their pictures as well as performance numbers for the flagship 512 GB model. The images reveal a controller covered with an aluminum heat spreader, and the only contemporary controller that supports 3D NAND and comes with such a heat spreader is Silicon Motion’s SM2260 (which uses two ARM Cortex cores and has eight NAND flash channels) Technically the SM2260 can support LDPC ECC technology and 256-bit AES although this has to be enabled in firmware. At present, only Micron sells SSD-graded 3D MLC NAND to some of its partners, so it is logical to assume that the MTE850 drives use Micron. Transcend is the third company to offer an SSD family featuring 3D MLC and SM2260 after ADATA and Mushkin, so the drives are going to have rivals that offer similar performance and functionality. Transcend’s MTE850 family consists of three models with 128 GB, 256 GB and 512 GB capacities that come in M.2-2280 form-factor and use a PCIe 3.0 x4 interface. The manufacturer rates MTE850’s sequential read performance at up to 2.5 GB/s and its write performance at up to 1.1 GB/s when pseudo-SLC caching is used. When it comes to random performance, Transcend does not publish any numbers at all, but we know that the SM2260 controller is officially capable of up to 120K/140K 4KB read/write IOPS, although the final value for these drives will be firmware dependent. The MTE850 SSDs are expected to follow performance trends (the drives are somewhat comparable to Samsung’s 950 Pro released in 2H2015), and it is noteworthy that Transcend became the fourth independent SSD supplier after ADATA, Mushkin and Palit to introduce 3D NAND-based SSDs. We are still a few months away from a wide availability of 3D NAND-powered drives from independent vendors, but such products are getting announced today - we expect to hear more at Computex in June. Transcend did not disclose MSRPs for its MTE850 drives, but since the SSDs have direct competitors based on the same memory and controller (ADATA’s XPG SX8000-series at $90-$242), it is highly likely that Transcend’s SSDs will be offered at similar price points. The MTE850 drives will be covered by the manufacturer's three-year warranty.